In September, Ashley from Ashbam was my featured blogger. You can read that post and see other past featured blogs under the "blog of the month" label! Being my blog of the month gets you a designated blog post, a sidebar button, and a mention on my Twitter account. The sidebar button stays up all month long. I don't believe in necessarily making bloggers pay for advertising and I'd much rather show you blogs that I really enjoy reading. And I hope you end up enjoying them too! 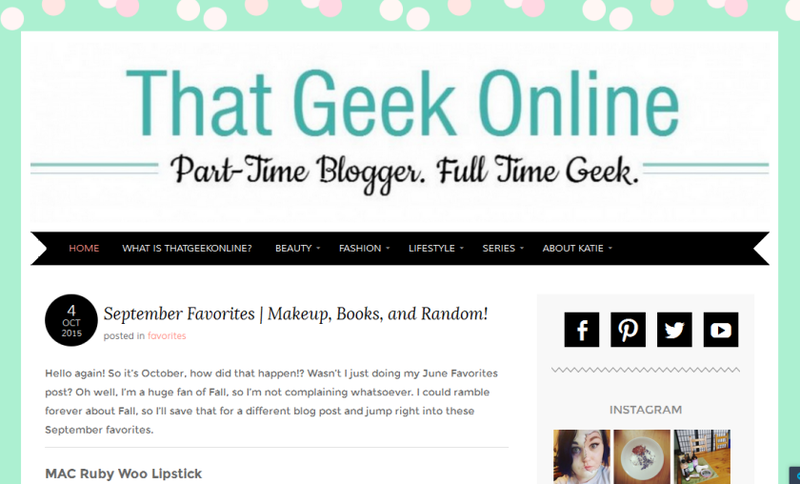 This month, Katie from That Geek Online is my featured blogger. She and I connected on Twitter quite a while ago, but I feel like we're kindred spirits in a lot of ways. She blogs about a little bit of everything, so you're bound to find something you enjoy on her blog. She just finished up a month-long interview series based on strong females, as well. And at the moment, she can be seen with awesome green hair. What's not to like about any of that? !